That's right, it's time for Field of view once again — your home to find out what's being going on in the world of VR and AR from the past seven days. This week we spoke to Oculus bosses Nate Mitchell and Jason Rubin about Oculus Rift Phase 2, subscriptions and Vive hacks, while also getting a hint about the nature of the company's standalone VR project. We also looked at who else is working on standalone VR headsets and spoke to Leap Motion about its plans for mobile VR, China and embodiment. But what else has been happening? Well, read on to find out. Coming out of Disney's D23 expo over the weekend was Marvel's new VR game, which has been made in partnership with Oculus. And we were on hand to get a first look ahead of its release next year. And, listen, if VR wasn't made for doing the Hulk Smash, then what was the point? Thankfully, Marvel Powers United VR perfectly captures the angry authenticity of the big green guy, and a few other characters from the universe. In our short time, we got to hack down enemies with Deadpool's katanas, launch ourselves into the air with Rocket Raccoon's jetpack, and do some good old-fashioned clobberin' with Hulk's mammoth fists. 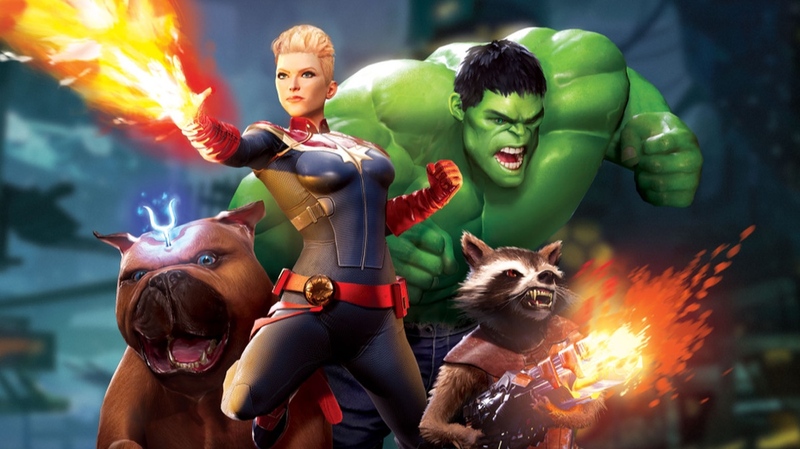 In fact, playing at Hulk and then Rocket, we got to appreciate the difference in scale that developer Sanzaru Games has created, and every character we played felt significantly different to the last. Movement is controlled by moving the joystick, but some characters had the option to teleport across short distances, which (as we've found with this locomotive technique before) actually felt less jarring than using the stick. The level itself was a little bland, as we blasted and swiped away waves of generic baddies, but there's a lot of promise here. It's a massive property for Oculus to get - let's hope it delivers next year. Based on the novel by Ernest Cline, Ready Player One is set in 2044 and a world which has been driven to the brink by famine and climate change. With earthlings escaping through the virtual realm, the Steven Spielberg-directed film will tell the story of Wade Watts, who is given the chance to win a treasure chest of coin through the artificial realm. Now, thanks to Entertainment Weekly, we have our first still of the movie from, which is set to be released in March 2018. Looks like a less crappy version of a LG 360 VR that, doesn't it? Premier League outfit Stoke City have announced that its goalkeepers will now be trained using virtual reality, with the club joining up with Beyond Sports to analyse games and practice sessions. This technology focuses on four areas: on-field spatial awareness, pressurised game scenarios, decision-making and packing a number of scenarios into a short time frame. Those with a Viveport Subscription just got a fresh boost, with HTC announcing that the service now offers more than 200 titles. Not only does this show a continued push from the VR giant to increase its library consistently, but also the fact some developers are embracing the premise of subscription - even if Oculus isn't planning to delve into the same area. Okay, we admit we're sneaking in some mixed reality action here, but it's an interesting look at how powerful ARKit already is when powered with other platforms. Here, we can see someone using a HTC Vive setup to draw a flower, which is then mirrored by some kind of weird lollipop monster and viewed through an iPad. This blurs the lines between AR and VR, since it can be interacted with and viewed at different angles, and not just simply overlaid onto the real world. Echo Arena is, essentially, a zero-gravity disc-throwing multiplayer VR mode of future sci-fi game Lone Echo. Exclusive to Oculus, the objective involves scoring goals while avoiding obstacles and opposing players trying to wipe you out. The draw here is the multiplayer component, which allows you to feel like you're actually playing a team sport - something which is so far a rare experience in VR. Our US Editor Hugh Langley has had a quick play with Echo Arena, and his words were, "Holy sh*t this is good". So there you go, folks, have at it.